Tuners have been busy modding ZR1s and getting them to the track. But, like many of you, I’m interested in witnessing what owners of these extraordinary cars can do with them in the quarter-mile bone-stock (that is, without modification). To me, as always, it just didn’t seem the car magazine road tests results had done the car justice. So we developed a plan. Two adventuresome ZR1 owners stepped forward and responded to a post I made offering a rental venue at Maryland International Raceway (MIR) to help them figure out their cars. On Wednesday, April 8th ZO6Jeff and zosix427 brought their beautiful cyber gray 2009 ZR1s to MIR for a day of learning and camaraderie. Both cars are bone-stock. In seven hours three drivers made a total of 45 passes in the cars. Hard-driven hot-laps of two or three passes was the routine. And through all that, neither car broke nor sustained track incidents. Both cars were run in Traction System Off, one click of the console button. The suspensions were set to Tour. Both started the day with fuel at more than half-tank and heat-soaked from the long drive to MIR. And no sustained cool-down was permitted either car during the day. • zosix427 made 16 Passes and had a previous 10 in his ZR1. He has been drag racing Corvettes for many years. • Ranger made 11 passes, my first ones driving a ZR1. I’ve raced Z06s before. The weather was generally favorable. Density Altitude ranged from zero feet at 10 a.m. to +600 from 2 p.m. onward. The Station Pressure was 29.55 to 29.60 (at 80 feet altitude). Dew Point was about 25 degrees. Air Temperature ranged from mid-50s to mid-60s at air-inlet height. Winds were not a notable factor. Track surface temperature was above 60 degrees in the morning and reached 80 by early afternoon. Track surface preparation was very good. But the first 100’ of the racing surface received its weekly scraping that morning, eliminating the rubber that had formed the racing groove during the previous week’s race days. Jason Miller, the MIR operations director, did the track prep for us and mitigated the absence of an established groove. I must say Jason maintains the racing surface with the care and attention of a marine biologist nurturing a coral reef. To help begin setting a racing groove in the fresh prepped track, I hot-lapped the day’s initial two passes in my bone-stock C6Z06 on BFG drag radials. The second pass netted 1.67 10.96 128.05. A video of that pass is included below. The DA at the time was zero feet. From that point on the DA steadily rose. 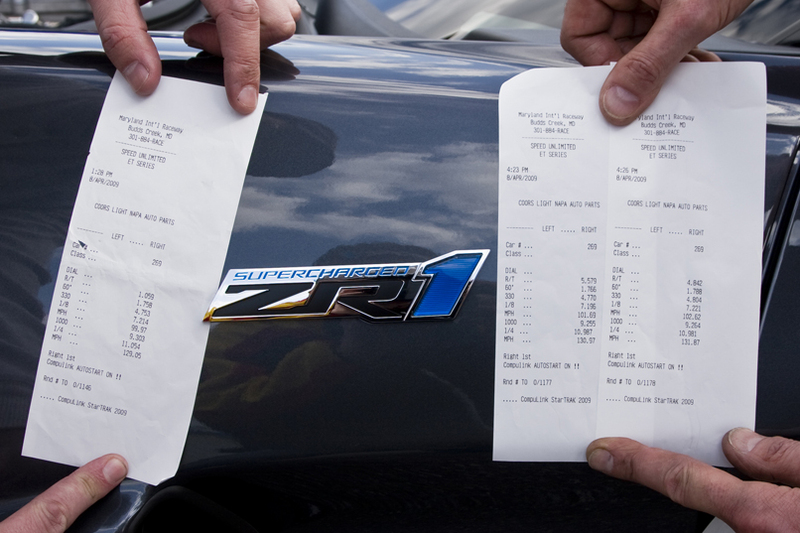 Here are the slips of the day’s best passes in the ZR1s. These videos can be seen in full-screen HD by clicking the youtube logo. racerns managed a big-slip launch on stock tires on his tenth pass that produced the best 60’ and 330’ of the day, 1.75 and 4.75 respectively, for 11.05 129.05. Here is a video of that pass. zosix427 ran several PR passes on stock tires in the 11.20s at 127-128 on low-to-mid 1.8 60’ times. His best ET was 11.24 128.32. Here is a video of that pass. Ranger ran a best on stock tires of 1.90 11.21 130.45 and on drag radials 10.98 (twice back-to-back) 130.97 and 131.87. My 60’ on DRs were modest, 1.76 and 1.78. In light of my guest-driver status, I felt an duty to go particularly easy on the clutch. So I made fast, clean clutch releases, followed by a graduated throttle squeeze. The other two drivers experimented more aggressively with the clutch, with better results. My trap speeds were mostly above 130. That derived from shift-point correctness. Here is the video of my back-to-back 10-second passes on drag radials. A fabulous car, that’s hard to drive well for max acceleration. That’s why the car magazines haven’t shined with it. The torque of the motor is huge, presenting a challenge to avoid excessive wheel-spin. The solution involves heated tires and a progressive throttle-squeeze in first gear. But loss of momentum via bog has disproportionate, adverse impact on the 60’, 330’ and ET. GM set the ZR1 first gear ratio at 2.29 vice the Z06’s 2.66. That difference looms large in making torque at launch somewhat more manageable and allows the ZR1 to reach 67 before the shift. But it penalizes a loss of momentum more in the ZR1 than in the Z06. The car has a different rpm-making rhythm than the Z06; its rev limiter is at 6600 vice 7120. So a driver transitioning from the Z06 needs to eye the tachometer earlier than the engine-sound indicates. Clipping the limiters extracts an ET penalty. Slamming the limiter drop the car’s nose and kills the ET. The ZR1 transmission is a pleasure and shifts positively with little fanfare. Perfect. As always, proper hand position is still a must. The clutch engagement point is in the top-third of travel rather than the middle-third on other Corvettes. That requires getting used to. On ZO6Jeff’s car we changed the clutch fluid in the reservoir (three swaps) after pass #10 as a prophylactic. It was seriously nasty from infused clutch dust after starting the day perfectly clean. We repeated the three-swaps at pass #20 before mounting the drag radials. Again it had turned very nasty; but three swaps did the trick. I was very impressed with how stable and planted the car was under max acceleration. If you replay the video of the two 10-second passes, note how straight and true the ZR1 remained with only minimal movement on transitions. It behaved the same way for me on stock tires. I like that. It quickly gave me confidence going down the track. Finally I was impressed by the robustness of the car under hard running. Nothing broke; nothing felt weak. I had no wheel hop in my 11 passes. The clutches held up. But they do produce smoke through the center tunnel exit when intentionally slipped excessively. But unlike the LS7 clutch, the LS9 dual-disc did not glaze even once. I am happy to see GM has resolved that annoying issue. Now that I’ve driven both the ZR1 and the Z06 on the same day at the same track, which car is faster? The ZR1 for sure. It feels faster. It is faster. But it’s harder to launch without a loss of momentum. Still, post-launch, the very wide flat power-band of the ZR1 is unforgettable. And of course the exhaust note at full song, sounds like a genuine race-car. Sweet is an understatement. Just re-watch my 10-second-passes in HD widescreen with the volume cranked. That exhaust note is mesmerizing. It's like you are there. On my DR passes, a slightly more aggressive launch would have put the car into the 10.8s at a 600’ DA. I suspect some owner will get a ZR1 into the 10.60s on DR and the 10.8s on stock tires. racerns came very close to 10s on stock tires and would have been there with better shifts or the same DA we has at the start of the day or in a car not thoroughly heat-soaked from a long drive to MIR and so many passes. I must note that zosix427 drove seven hours to reach MIR; made 16 passes; and then drove seven hours home to honor business commitments at first-light the next morning. He’s a true car guy and racer who’s already done the driver-mod and wants to improve even further. He set a series of PRs in his ZR1 at MIR and will be knocking on tens in the fall with more seat-time. I forgot to mention to him (but will here) that as I was preparing to do a burnout on a pass in his car, On-Star called with a status report. I showed “mature judgment” in ringing off that call before spinning the rear tires to copious smoke. That was but a small token in return for the opportunity to make three passes in his ZR1. I extend once again my thanks to ZO6Jeff for the opportunity to join his son racerns in help wring out the ZR1. I know they will continue to drive the car in the full spirit in which GM unleashed it on the Corvette Faithful…often and at various racing venues. Also want to thank Chris for shooting the 62 videos of our activities at the event. Great job once again, Chris. Thanks, as always, go to Massimiliano for the use of his music. The owners and drivers of these two ZR1s will be happy to entertain member questions. Post away. Last edited by Ranger; 10-14-2009 at 06:43 PM. I just want to compliment Ranger for arranging this event, and for all the help and advice he provided to my son and zosix427. It was a pleasure meeting him and working with him in gathering/organizing the data from all the passes. I would also like to say I'm very proud of my son. He did an execllent job in learning how to launch the car. Now, he can work on improving his shifting. I have to take some credit for his performance, I taught him how to drive a stick shift on my '90 ZR1. I feel that this day at the track was most of all a learning experience in how to get the the most out of the ZR1. After some of the initial passes, where both zosix427 and my son (racerns) began to get some improved 60' times and we saw the great shifting that Ranger was performing (he's a 'shifting machine'), we were joking that my son should do the launch (produce another 1.75 60' time) and then "majically" replace him with Ranger to do the shifting, then we would have easily seen 10s. IMO the ZR1, bone stock, is a 10 second car and when good drivers get enough experience we will start seeing those times. These are the write ups that I like to read. Keep them coming. That was a great write up. Good job to all the drivers for getting under 11.3. I think that 11.05 would have defiantely been a 10 second pass if the shifting was slightly improved. That was an amazing launch though. That is cool now that there is a bone stock motor ZR1 in the 10s (even though it may not have stock tires). What was the wheel/tire combo for the ZR1 on drag radials? Thank you Ranger and friends for your great work at the Dragstrip...and for your thorough write-up. ...What was the wheel/tire combo for the ZR1 on drag radials? My CCW Corsair Race wheels in 18" x 12" with Hoosier DRs. These are the wheels I first bought for my C6Z. I got the Hoosier DRs specifically for this event. They are too much tire for a stock-clutch C6Z. Last edited by Ranger; 04-11-2009 at 12:10 PM. Did racerns hit the limiter on his 1-2 shift on his 11:05 pass? Sounded like it to me. Without that it would have been a 10 pass I'm certain. Thank you for the full writeup. Was very much looking forward to it. Hopefully I'll see you at MIR with my GrandSport a couple years from now. Damn! i knew this was coming! Fantastic job guys and a great follow up! Ranger, do u have plans on getting a ZR1? So u think bone stock with drags will get 10.6? that's sick!! Great write up and great times.They pretty much equaled the best times for the Z06 so that means there is more left in the ZR1 and with some more seat time I am sure there are 10.6's just around the corner. The ZR1 needs a ZR1 Fast List Thread just as the Z06 has now. Great write up and fantastic times!! It sounds like the car bogs down upon launch. Is that a function of these cars not wanted to have the clutch slipped at all? As my dad said, Ranger is a shifting machine with not only his speed but his ability to hit the shift point perfectly. I don't believe he did any speed shifting on any of his run and neither did I. When you look at the time slip you can really see how much better he was on the 1-2 shift than me. His 1/8 mph was 2-3 mph more than me. Most of the time I think I was shifting too early on the 1-2, it comes up so fast after the launch that I felt that I had to rush to make the shift and would end up early. I also had some issues missing the 2-3 shift during the day but that was just being rusty on the fast shift. I did have another 1.79 60' on the stock tires but hit 5th instead of 3rd and ended with a 11.4. I think the 1.7 60's are at the limit of slip for the clutch because I also roasted the clutch on a few attempts :o. I ended up making 2 runs on the drag radial but I had never run on drag radial before so Ranger warned me about not slipping the clutch. I was able to pull another 1.75 on my 2nd run but ended up with a 11.10 due to my shifting. All and all a great day and I need to do some shift drills because I am eager to get back out there and give it another try for 10s on stock tires. I am sure someone will do it and I want to be one of them. I think you are hearing the tire spin after the shift. I believe that my problem really was shifting too early. It can take some clutch slip as that is how I was able to get my 1.75 60' on the stock tires but I was at the limit. We did not put the drag radials on until the very end of the day and only had limited runs on them (Ranger 3 and me 2) so Ranger was being very careful with the launch as not to smoke the clutch. Great job guys!!! yeah ranger, do you plan on getting a ZR1? This should go in a magazine somewhere.